Most people experience low back pain at some point in their life. There are many possible causes of back pain, and it is important to find the correct source so that proper treatment can occur successfully. 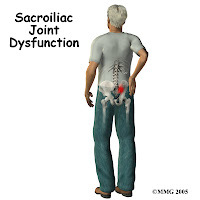 One common cause of low back pain is sacroiliac dysfunction. The sacroiliac joints are located on each side of the lower back at the top of the buttocks, connecting the sacrum (base of the spine) to the ilium (hips/pelvis). It has very limited mobility and functions . 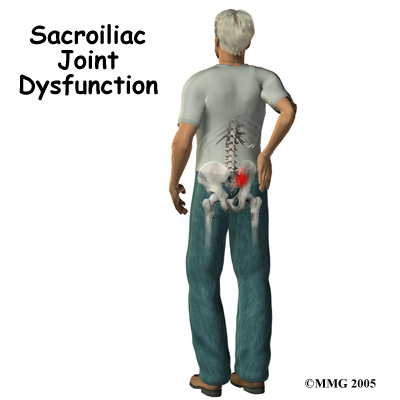 The stability of sacroiliac joint is both static and dynamic. Dynamic stability depends on numerous surroundings ligamentous and muscles structures. It has been argued that the loss of the dynamic or static stability could be the reason for sacroiliac joint pain . Sacroiliac pain is often one-sided, caused by either hypermobility or instability (too much movement), or hypomobility or fixation (too little movement). The pain can be of sudden or gradual onset and may radiate from the lower back to the buttock and back of the thigh. The pain is usually described as being sharp and stabbing or as being a dull ache. Twisting, extended sitting or standing with a sway back can aggravate the pain. It can result in stiffness with getting out of the bed or chair. The pain often results in limitation of functional activities such as turning in bed, donning shoes and socks, getting legs into a car, driving long distances . There are four main causes of SIJ pain: the most common is a mechanical factor, where the joint doesn't move as well as it used to, or it moves in the wrong way (lack of movement, hypomobility, or excessive movement, hypermobility). The joint may be stressed by abnormal alignment (lining up) of the pelvis and lower extremities. This can happen with flat feet, when your legs are uneven in length, or when the muscles that support your low back are too tight, too weak, or out of balance with each other. Things you do (or don't do) in your everyday life and work can also stress the SIJ. Some examples include a poorly supportive chair, poor posture, or when you sleep in a position that puts stress on your back . Other secondary causes of SIJ pain can be: leg length discrepancy or legs of unequal length, muscle imbalance in the legs or unilateral weakness of lower extremity muscles can, weight gain, especially around the area of the trunk, scoliosis (curvature of the spine), an altered gait pattern, poor postural awareness and habits in sitting, standing and daily activities . Sherman, A.L. (2006). Sacroiliac Pain: A Physical Therapy Perspective. Post-Polio Health. Summer 22(3): 1-3. Al-khayer, A., Grevitt, M.P. (2007). A review of sacroiliac joint pain. Coluna/Columna. 6(1): 46-50. New Englad Spine Institue. Sacroiliac Joint Pain: A patient guide.